J.D. 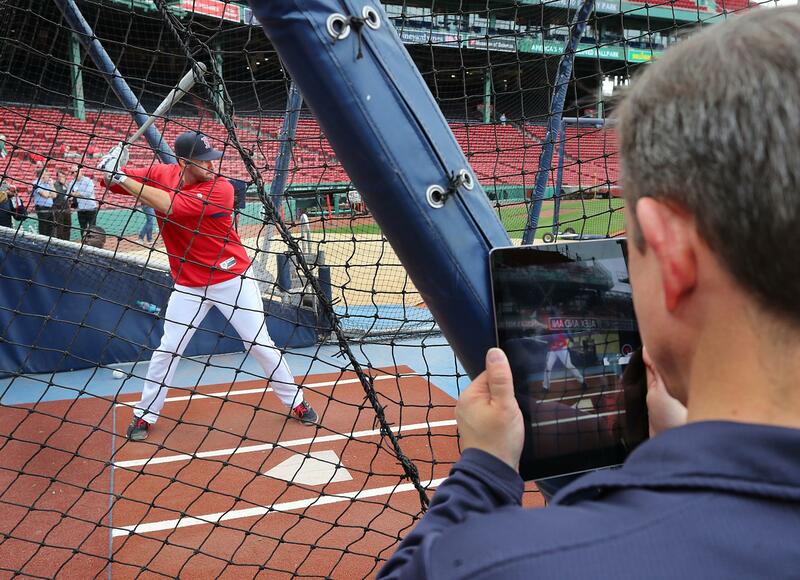 Martinez has his batting practice sessions recorded on a tablet by Red Sox video coordinator Billy Broadbent. The Red Sox slugger’s swing has been likened to a samurai sword and a Ferris wheel, and it gives him incredible power. Here’s how he does it. It isn’t supposed to work this way. 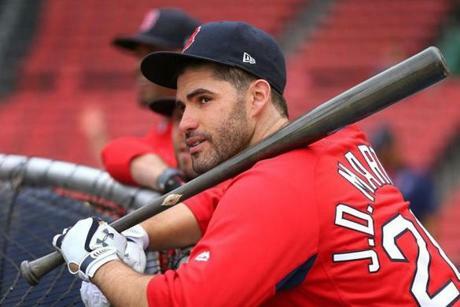 Players aren’t supposed to hit with power the way Red Sox slugger J.D. Martinez does. There are other players who hit opposite-field homers. But no one does it with the frequency, and on the types of pitches, that Martinez does. His eight opposite-field homers this season are three more than anyone else in the big leagues. His three opposite-field homers on fastballs that are either on the inner third of the plate or even inside and off of it match the total of all other righthanded hitters in the big leagues. So how does Martinez do it? How does he take pitches that would jam other hitters (their best-case scenario would be a blooper over the head of a first or second baseman) and drive them 350 feet? “You got an hour?” Martinez smirked when asked to describe his swing path. Perhaps the most telling part of Martinez’s swing is that the efforts to describe it draw not necessarily from baseball but from far-flung realms — among them another sport, amusement park rides, and ancient Japanese traditions. For most of his baseball life, Martinez’s swing was intended to travel a straight line. He was in the hands-to-the-ball school, trying to take a direct path with his bat to a pitch — and swinging down to the point of impact, in a way that often yielded liners or, more disappointingly, ground balls. He was failing to take advantage of his long arms and natural strength that offered the raw ingredients of a power hitter. After the 2013 season, Martinez engaged in a radical overhaul of his swing under the guidance of hitting instructors Craig Wallenbrock and Robert Van Scoyoc. During the downswing, Martinez keeps his hips and shoulders closed while whipping the bat down with his arms. Rather than sending the bat in a line toward where he thinks the ball will be, on his downswing, Martinez is trying to “groove his swing in a certain lane” close to his body, according to Red Sox assistant hitting coach Andy Barkett. The bat remains in a neutral position in the downswing, as does Martinez’s body. His shoulders, hips, and legs are all aligned with the barrel of the bat. To Wallenbrock, that starting point is crucial to permitting a hitter to attack a wide variety of pitches. The samurai notion is one that Wallenbrock and Martinez have discussed in shaping his ideal swing. In perhaps more familiar terms, Hyers likens the movement of Martinez’s bat to that of a golfer who remains square to the ball. “He’s not a spinner,” said Hyers. “He’s a guy who stays in his legs and has really good direction. What I mean by that is he has a good foundation with his hips underneath him. It allows his hands to work through [the swing]. That downswing is what positions Martinez, on his upswing, to attack the pitch across the broadest possible expanse of the strike zone. After years of working with Wallenbrock and Van Scoyoc, Martinez is as good as anyone in the game at concluding his downswing at the back of the strike zone. By the time he’s ready to send the barrel through the strike zone, it’s moving up and “on plane,” matching the trajectory of the pitch. The notion of an uppercut, on-plane swing was famously espoused by Ted Williams, embraced and taught by Wallenbrock and Van Scoyoc (among other private hitting instructors), and has now entered baseball’s mainstream in the launch angle era. While Martinez wasn’t introduced to the notion until his offensive reinvention following the 2013 season, it immediately resonated. “I’ve always thought about numbers,” said Martinez. “I’ve always been good at math. [A swing is] kind of just angle-matching. I heard Josh Donaldson say one time that I don’t try to hit the ball. I try to match the plane the pitch is on. I’m not a ball-hitter. I’m a plane-matcher. Yet even as an uppercut swing through contact has become the new norm in baseball, Martinez still represents a distinctive practitioner of the art. His barrel enters the strike zone on its upward trajectory deeper in the strike zone than most. “His length in his swing path is so much longer than a lot of guys who hit in this league,” said Hyers. Standard practice in baseball is to look to make contact with fastballs out in front of the plate, while staying back and driving breaking pitches to the opposite field. One big league hitting coach this spring even went so far as to dismiss the possibility that a hitter could look to drive inside fastballs out to the opposite field. Yet that is exactly what Martinez now does. Because he is on plane deep in the strike zone, and because of the neutral position he has maintained through his downswing, he’s capable of getting his hands inside even pitches that are in and off the plate while driving them out to the opposite field. If he reads a breaking ball, so long as he stays on the path of the pitch, he typically can pull those pitches out to left while making contact further up on the plate. “I talk about getting into a hitting zone to hit the inside fastball deeper than you hit any other pitch,” said Wallenbrock. “If you can get into a plane to hit the fastball, what you do is, you stay along that path and don’t commit the barrel. “If I get into path and stay along that path, I catch the fastball deeper and continue on that path, and relate to the slower pitches I hit more out in front. Or if I pick up that late movement and I haven’t released my [bat] head, I can slightly change direction and still go out and get a ball that’s further away. ■ Martinez will often take batting-practice swings without any movement in his legs, in order to isolate and lock in the right movements of his shoulders, arms, and hips. ■ Both around the batting cage during batting practice and in the on-deck circle during games, Martinez repeatedly performs top-hand drills to hard-wire the downward motion that precedes his efforts to match his swing path to the plane of the pitch. The length of that lane — the ability of Martinez to get on the plane of the pitch (even a 97- m.p.h. fastball) deep in the strike zone and to stay on it all the way to the front of the plate — has been a hallmark of his brilliant performance to date, and it is what separates him from so many of his peers. It helps to explain how he can defy logic by taking inside fastballs and driving them over the fence to right and right-center, a true line-to-line hitter with power who is off to a remarkable (.343/.397/.680) start. “Is he looking to sit there and say, ‘My approach is to look for a fastball middle-in and try to hit it into the right-field seats?’ I don’t think so,” said Barkett. “I would think that his approach is grooved, his swing is grooved to a certain slot. And if his timing is correct and he catches the ball in a certain spot and he’s behind it, it’s going to go that way. The Red Sox signed J.D. Martinez to a five-year deal in February.